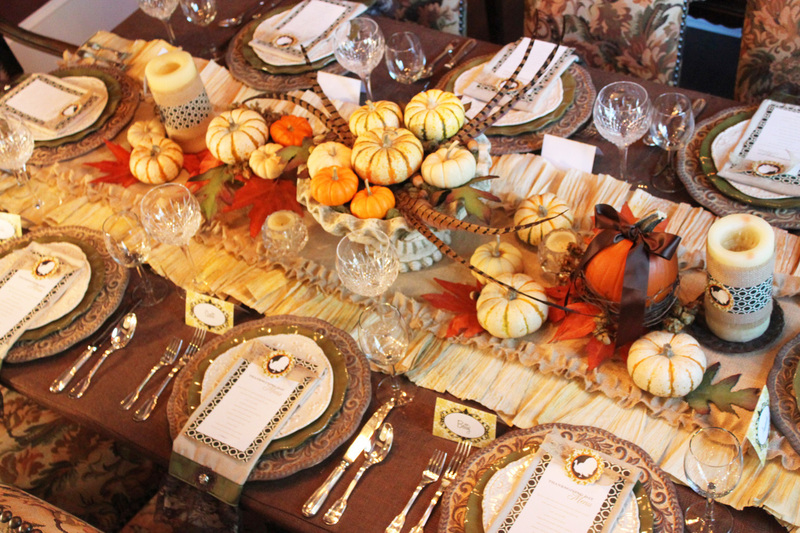 Today I'm sharing the Thanksgiving tablescape I did last year when we entertained my husband's family at our home. 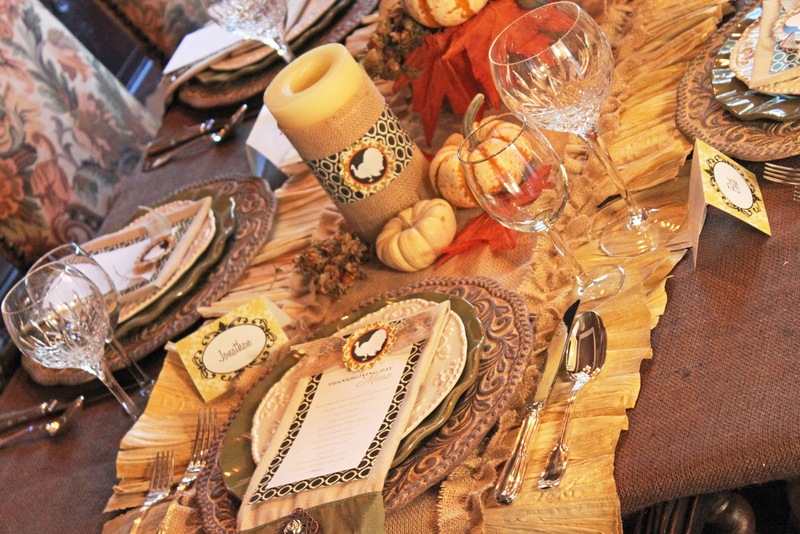 I wanted to create a warm, welcoming table that wasn't too fussy. 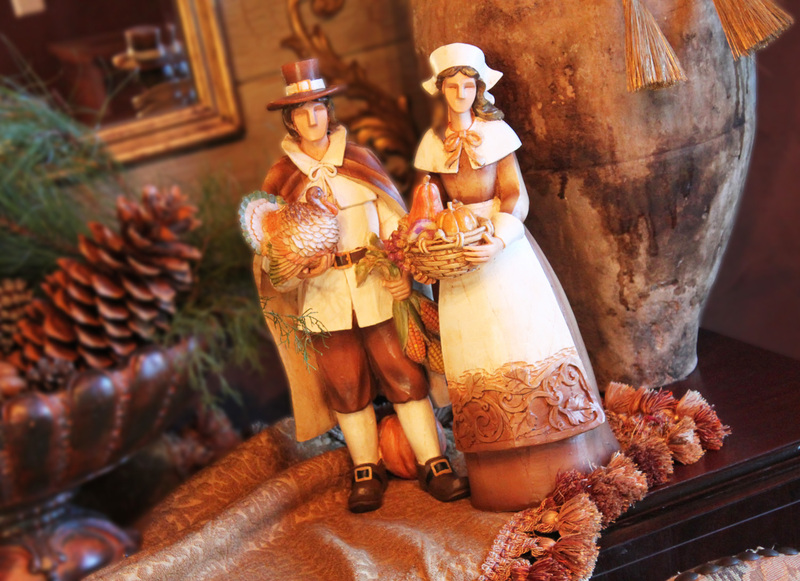 It was important to me for everyone to feel comfortable and "at home" but also know that it was a special day for celebrating all the things and people we are thankful for. 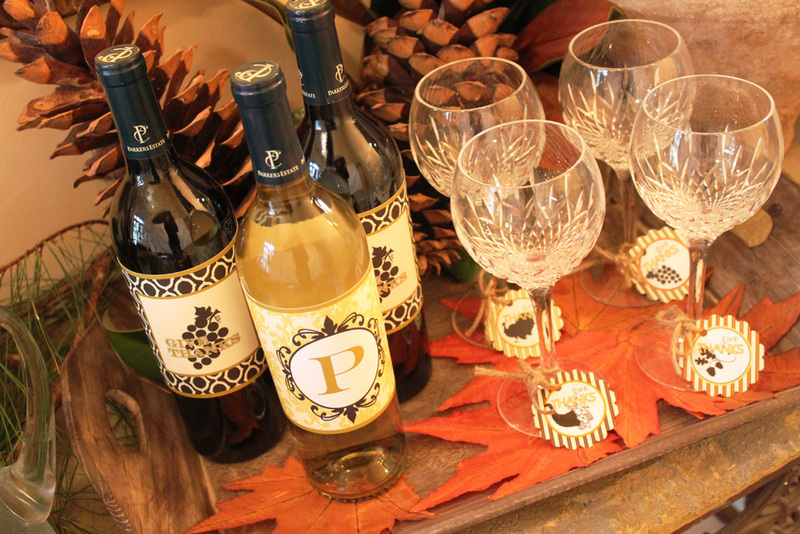 The tablescape is full of DIY projects so I hope you'll be inspired to try a few yourself this holiday season. The fabric garland is a fun one and super easy! It's very versatile, too. 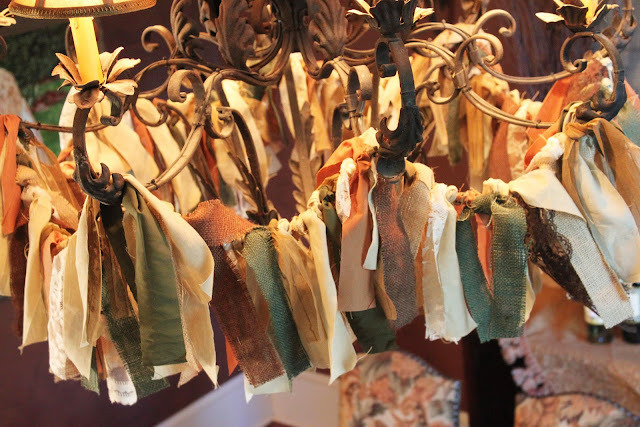 Hang it on the stair bannister, drape it across a mantle or do as I did here and swag it around your chandelier. There is no sewing involved -- just some fabric and a pair of scissors. Cut, tie, cut, tie.... that's about it. And what a show stopper! Specialty napkins.... personalized menus..... and a fabulous table runner -- great details to add to your Thanksgiving table. 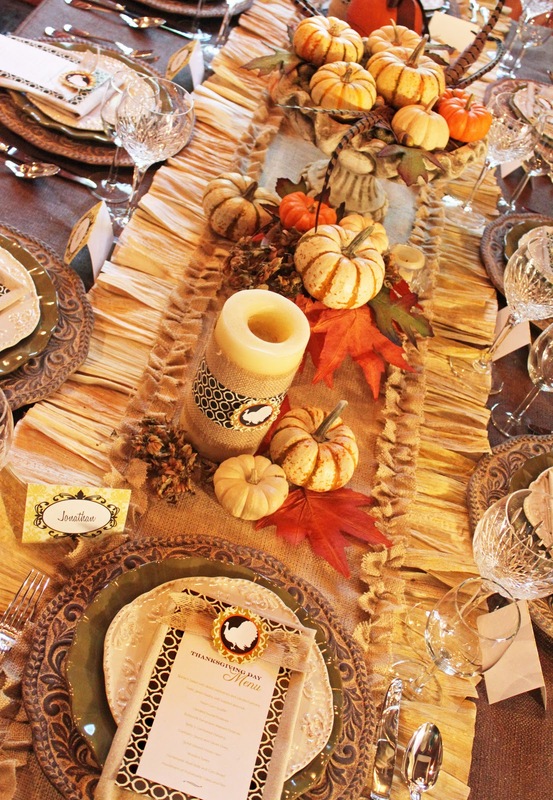 Here I used the Amanda's Parties TO GO Thanksgiving Collection papers to mat my menu. I typed a menu in Word and printed it onto white cardstock. 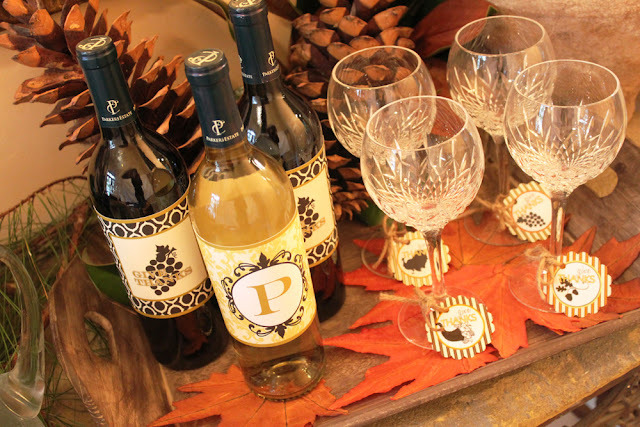 Next, I cut it out and put it over the decorative paper from the Thanksgiving collection and then added some ribbon and a 2" logo from the collection. There is a full tutorial here. 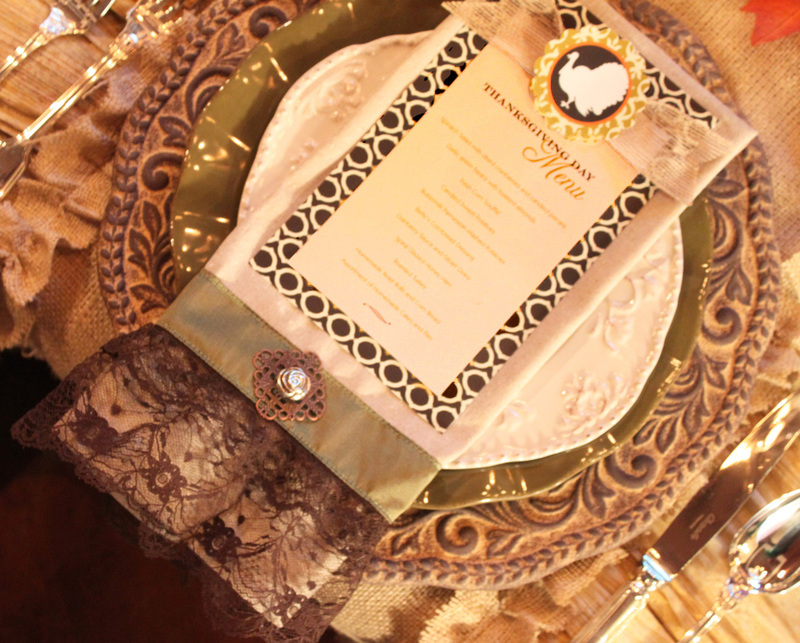 For the napkins, I used inexpensive natural colored muslin, some ribbon, brown lace and a few embellishments that I found on the jewelry making aisle at Hobby Lobby. A project well worth a few hours time -- simply beautiful. And my favorite, the table runner, I made with burlap and corn husks. Yes, you heard me right. Corn Husks. That's not a ruffle -- well, not a fabric one anyway! It's a corn husk ruffle. Simple and inexpensive, too. I'm planning to have a tutorial later in the week so check back if you'd like to make one of your own. 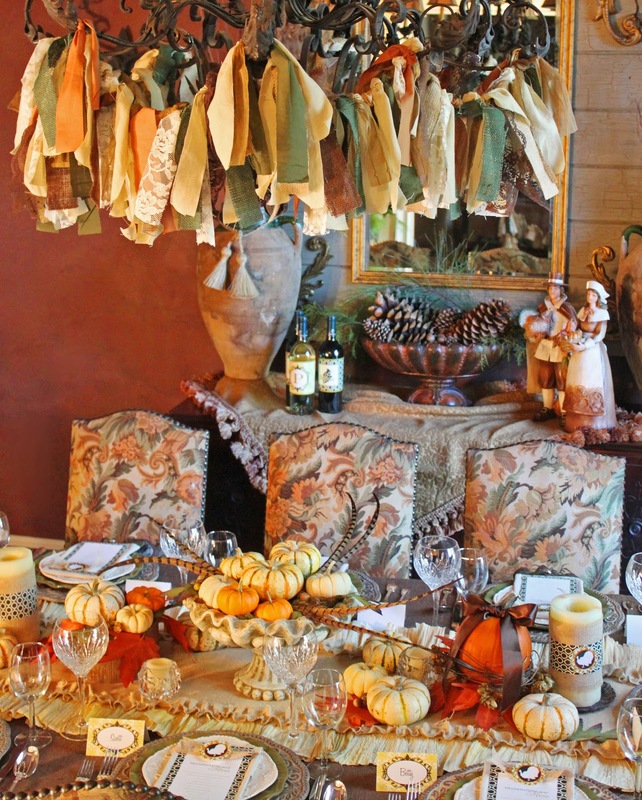 For this part of the display, I took a pie pumpkin and wrapped it with a few grapevine strands and added a brown satin ribbon. 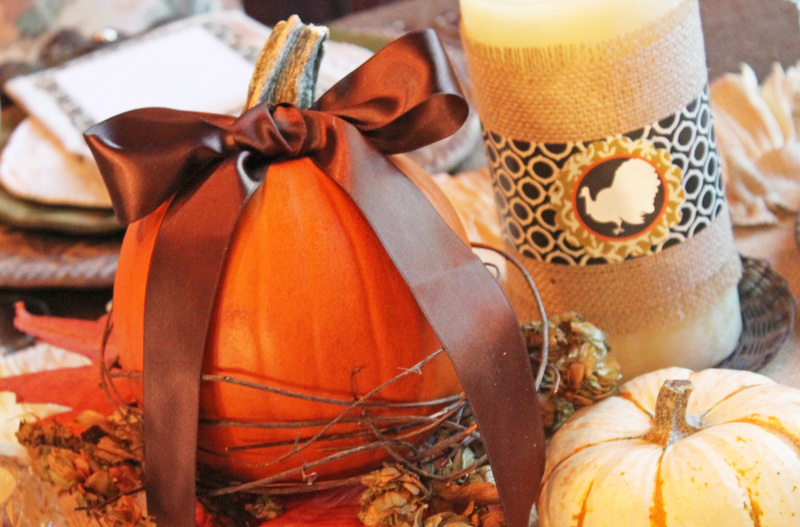 The candle was wrapped with a strip of burlap which I frayed on the edges by pulling a few strings out. 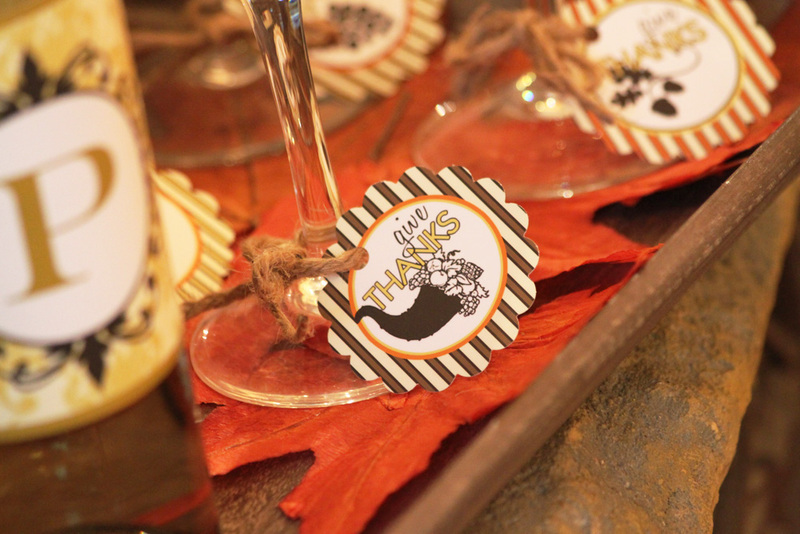 I then added a strip of the Thanksgiving Collection's decorative paper to coordinate with the menu and added a 2" Thanksgiving logo also from the collection. For the sideboard, I used some natural materials like over sized pine cones, fresh pine sprigs and nuts to fill a decorative container. 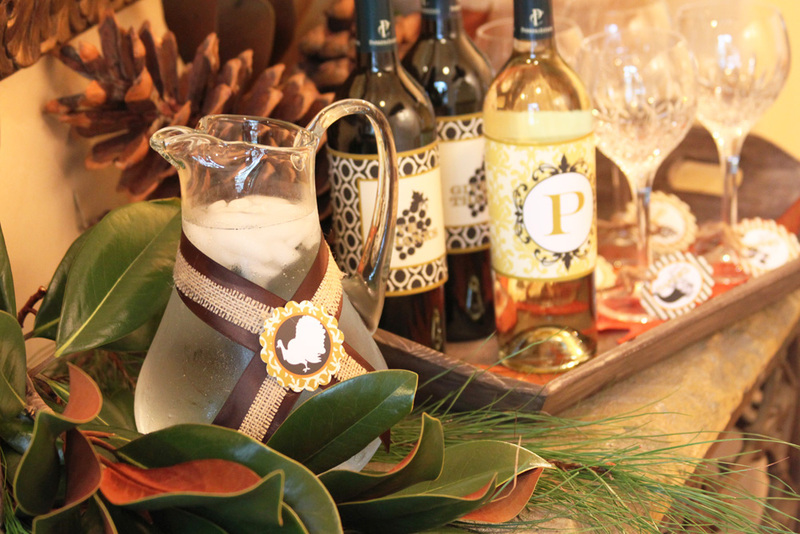 I added willow branches and a natural fiber tassel to the olive jars and set out my pilgrims. 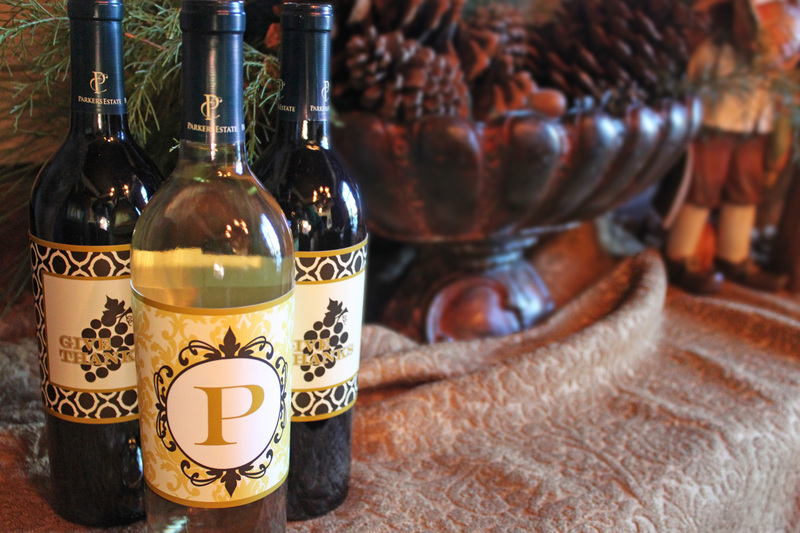 For the wine bottles, I used the Thanksgiving Collection's wine bottle labels of which one is personalized with your family initial. 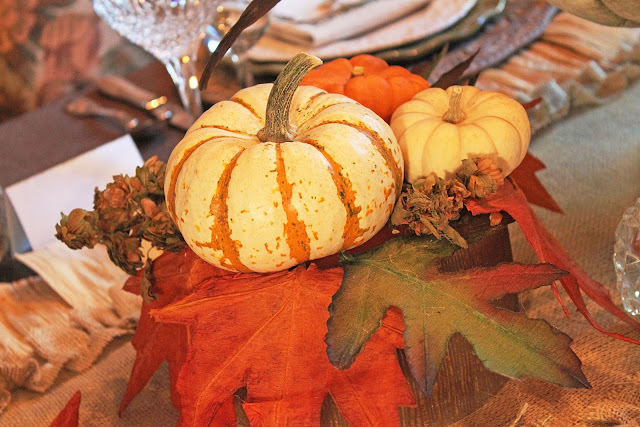 A centerpiece doesn't have to be hard or time consuming. I created this one by arranging a few bags of mini pumpkins and some pheasant feathers in a clay container I already owned. 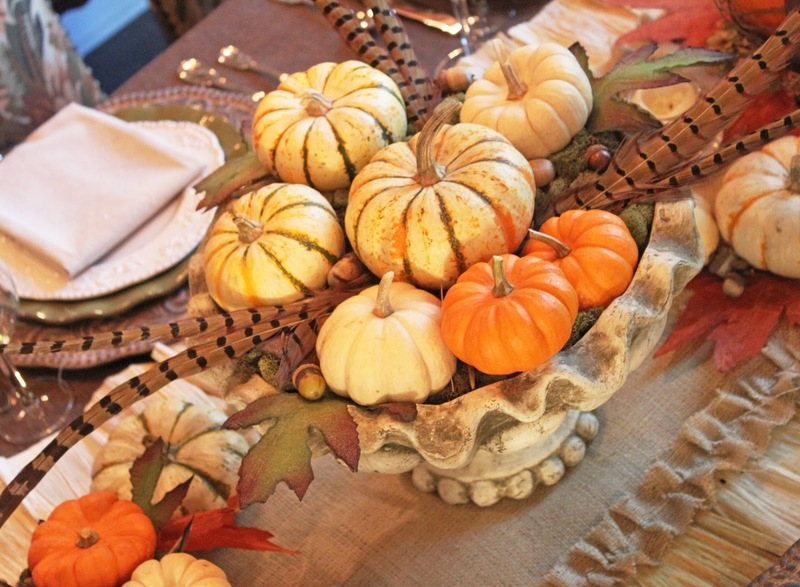 First I put moss in the container, added the feathers, then the pumpkins and accented with a few acorns from my backyard. 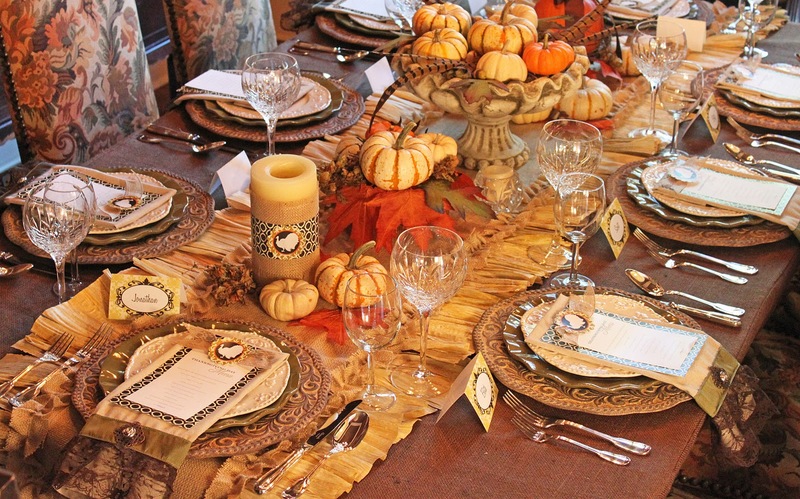 I hope you are inspired to create a special Thanksgiving table of your own this year! 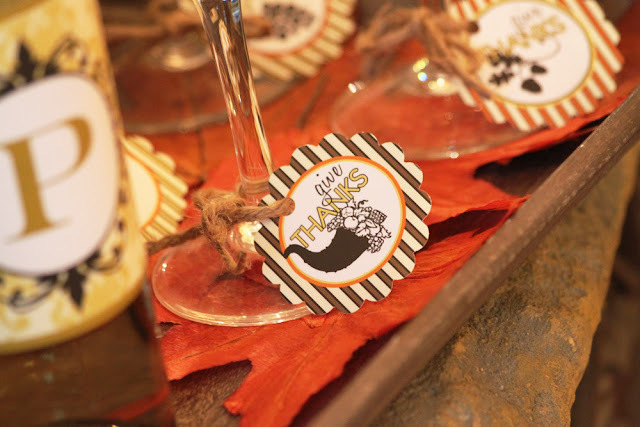 The Thanksgiving Printables set is on sale now for only $9.00 in my shop. Study Mri Shows Geometry, Not Gender, May Explain Acl Injury Risk Health Imaging. 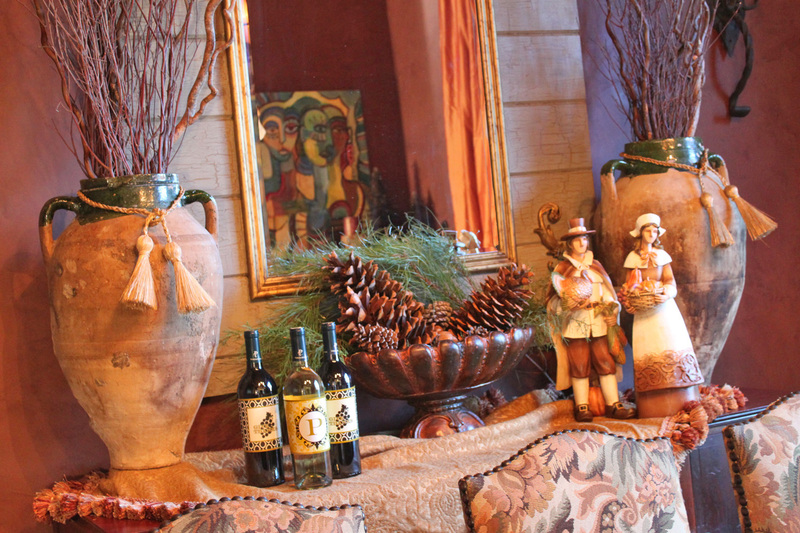 Company hospice care of southwest michigan. Find casino jobs and position openings in michigan city. It doesnt matter whether youre buying a new car or used car its easy to get caught off guard about the costs to keep that car on the road, especially when it comes to life insurance purchases. Raindances thunderstorm system is a fully automated and walkaway high throughput targeted sequencing solution that enables researchers to process 96 samples per day run on a proven platform that generates higher quality data faster than ever before. Full text access for premium subscribers only. Budgeting For The Uncertain Times Business Standard. Michigan truck driving jobs in michigan.